All Havahart traps are constructed of sturdy wire mesh, galvanized for maximum resistance to rust and corrosion. Mesh openings are smaller than on competing traps on competing traps of comparable sizes. Fully assembled and ready for use, Havahart cage traps come in models sized for a variety of animals. Some models open at both ends to give target animals extra confidence to enter the trap. 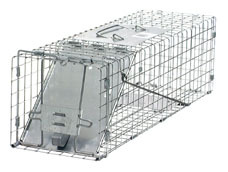 Our full range of conventional Havahart cage traps are designed for the occasional needs of homeowners and gardeners. For the year 'round requirements of professional wildlife mmanagers, pest control operators, SPCA's, and animal control officers, we offer heavy-duty Havahart professional cage traps. 24"x7"x7" Professional model, one spring-loaded door 14x14 gauge wire. Target animals: skunks, squirrels, rabbits. Model #1078.